It was only a matter of time really, and it makes logical sense. This week, WhatsApp has confirmed that it will soon allow companies to purchase ads within WhatsApp Status, the platform’s own variation of Stories. Monetization has become a key focus for WhatsApp. Now one of the most popular apps in the world – at 1.5 billion users – parent company Facebook is keen to find ways to convert that attention into revenue. And definitely, there’s significant revenue opportunities there – among the 60 billion messages being sent in the WhatsApp every day, a huge amount of them already relate to business transactions. In a recent survey, for example, over 80% of small businesses in India and Brazil said that WhatsApp helps them both communicate with customers and grow their brands. WhatsApp Status, at last report, currently has more than 450 million daily active users. The signs are clear that Facebook’s moving to accelerate the app’s revenue potential in the wake of the departure of founder Jan Koum. Back in January (before Koum left), WhatsApp’s new business app was launched, a first, significant step towards facilitating commercial transactions through the tool. In August, WhatsApp announced a new customer chat option which would finally enable some level of monetization within the app, with businesses being charged a small fee to respond to customer queries. But ads are the biggest opportunity here, and also what Facebook does best. Rumors of ads in Status have been swirling for some time, but now, we have official confirmation of a new ad option within the messaging platform. Interestingly, Daniels also noted that Status ads would be powered by “Facebook’s native ad system”, which likely means that WhatsApp Status ads will be available as another option through Ads Manager. 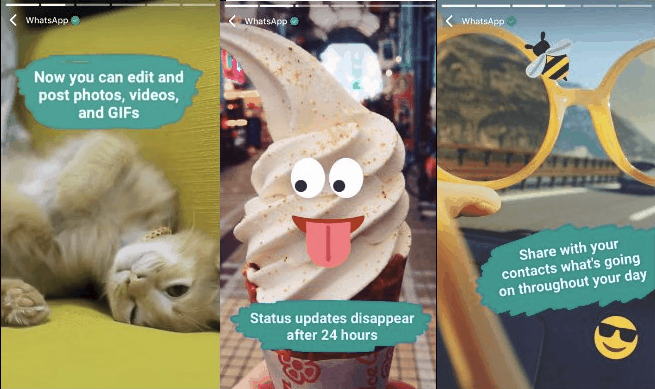 That could make it very easy for businesses to cross-promote through Facebook Stories, Instagram Stories and WhatsApp Status with a single campaign, which will no doubt be an enticing consideration for some. Right now, we don’t have any more details, but it is worth noting that a significant new ad opportunity is coming. And that could end up being huge for Facebook. This entry was posted in text, Uncategorized, WhatsApp. Bookmark the permalink.